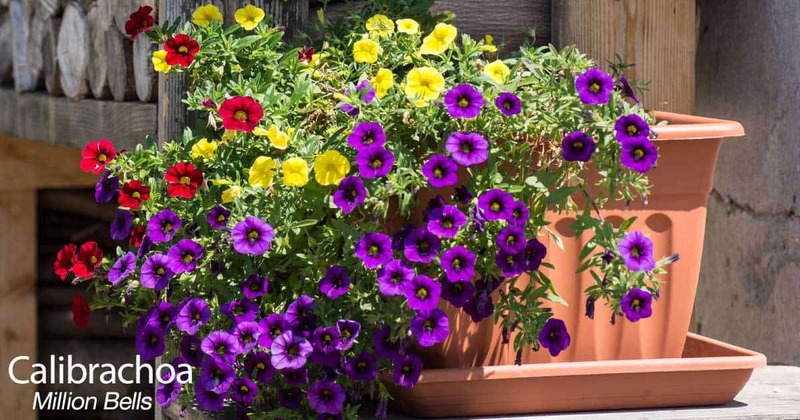 You’ve seen the Calibrachoa, a tender perennial commonly known as “Million Bells.” You’ve enjoyed this plant in the nightshade family filling containers and baskets with bright, vibrant flowers, screaming… Look, Look, Look! They are a perennial, evergreen and short-lived, a trailing plant only grows about 2-9 inches tall and develop beautiful, colorful blooms until frost. 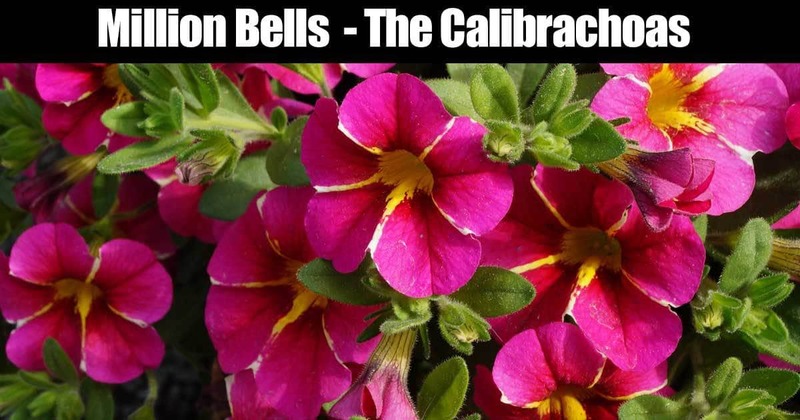 Calibrachoa million bells originated in the 19th century somewhere in Mexico by a pharmacologist. Since that time they gained the name “Million Bells” due to their production of hundreds of bell-like flowers in various colors like violet, blue, pink, yellow, magenta, white etc. Calibrachoa is a must for your summer gardens! They are thick, fleshy and somewhat sticky structured leaves and the Calibrachoa flowers generally crawl over their stems which are 6-15 inches long. The stems are similar to petunia plants with five eared lobes and yellow throats. The million bell petunia like flowers grow about an inch in length and produce no fruits or seeds. Flowers simply fall off after their blooming period. They are popularly grown in containers or hanging baskets and window boxes. They can be a little expensive since they tough for extreme hot or cold weather conditions. They make great additions used alone or as part of hanging baskets or window boxes as their long stems, spill and cascade over the pots or containers. Moreover, unlike petunia flowers, do not produce seeds and stop blooming. Instead, they keep on blooming until the environment freezes. You can pinch them off if you are fond of bushy shrubs. Million bells care requires are minimal. Fairly moist soil and dry temperatures with regular fertilizing are primary care needs for calibrachoa. Full Sun Plants – Million Bells are considered to be full sun plants. They can do best when placed in direct sun for at minimum of 6 hours daily. If plants do not get enough light they may look tired and blooming will decrease and the plants will begin to stretch. This is an indication that the plant needs to be moved in a location where it gets at least 4-6 hours of direct and filtered sun in a day. Its critical photoperiod requirement may differ from one variety to another. For the Minifamous Yellow Lilac Star, MiniFamous Lemon, and Million bells terra cotta, uniform flowering requires 11 hours of sunlight exposure every day. On the other hand, MiniFamous White Pink Star and Superbells Pink need somewhere in between 11 or 12 hour critical photoperiod. Lastly, the million bells group with the varieties Superbells White, Superbells Red, and Million Bells Trailing White will require around 13 hours of daylight. Fertilizer Needs – Lighting is important to a bright, eye-popping, color display Calibrachoa provides. But fertilizer is also very important. Heavy blooming the entire summer means heavy demands on plant nutrition. To keep plants strong fertilize every other week with a liquid fertilizer. Once per month if you’re fertilizing with a solid granular slow release plant fertilizer. Many growers add granular fertilizer to the soil when planting Million Bells initially. After 6 weeks of blooming, and the solid food has run out, begin applying liquid plant fertilizer every 10-14 days. Fertilization, in short is the key for blooming you calibrachoa throughout the season well. Soil – Calibrachoa prefer very well-drained soils. Most garden soils do not have the best drainage. This is why Calibrachoa is normally found growing in containers. Use a good quality potting soil in your containers, with excellent drainage. For soil guidelines check out this article. Water Requirements – Calibrachoa needs generous amount of water for “soaking” the roots. However, the soil needs to be given time for dying out until the next watering cycle. When watering water the soil thoroughly and allow the top 1-2 inches of soil to dry before watering again. Soggy soil lead to plants rotting. Grooming For More Million Bells Flowers – When plants start looking tired or non-vibrant, it signals for trimming. Trim your calibrachoa up (1-4 inches) in mid-summer time. This process is not complicated. Trim plants to a neat and tidy status. This will temporarily reduce the blooming for a week or two but picks up quickly as trimming stimulates root growth resulting in fuller bushy plants. There is no requirement of deadheading calibrachoa. They are a self-cleaning plant. Spent flowers automatically drop following another batch to bloom. But, it is advised to pinch once in a while for compact growth. Pests and Disease – Pest and disease are rare with Calibrachoa. However, they can have issues with Pythium and phytophthora. Insects and aphids can cause problems can completely destroy plant stems. Check with your local garden center or extension agent to control solutions. Million bells may also acquire the black root rot disease, a problem caused by Thielaviopsis basicola. This fungus affects a wide range of plants. Many gardeners claim black root rot took out a huge portion of their crops reducing their yield exponentially. Symptoms may appear the same as iron-deficiency which include uneven heights, black areas on roots, yellow leaves, and stunting growth of roots and foliage. As markets mostly sell Calibrachoa hybrids, you need to propagate them in other ways apart from seeds. Let us take a look at the steps of starting calibrachoa plants from cuttings. 1. Cuttings – Early spring is the best time for taking calibrachoa cuttings. Take cuttings early in the morning to prevent moisture loss and before the temperatures get hot and sun is at its highest. Using a sharp utility knife take 3-inch tip cuttings. Cut tips can be covered with a moist towel to prevent moisture loss. Short growing varieties may be cut very close to the ground. 2. Soil and Pots – Using 3-inch pots filled with a moistened (not wet) starter mix of 1:1 peat moss and perlite. 3. Preparation – Remove bottom leaves prior to sticking cuttings. Roots develop around the removed leaf nodes. Dip cuttings in a rooting hormone to stimulate the rooting process. 4. Sticking & Humidity – Make three holes in each pot with a pencil and insert the one cutting in each hole. Firm the soil around each cutting to make it stand upright. Humidity is an important factor for successful rooting. High humidity improves the chances greatly. Place an empty plastic soda bottle bottom cut over the pot. The pot needs good filtered light, like a kitchen window, but no direct sunlight. Remove the cover once cutting begin to grow. 1. Select the right variety of calibrachoa. There are many colors and make great combo pots. Propagate one variety and label the pot. This makes creating a mono basket much easier. 2. The schedule of cutting and potting is extremely important. At retail stores, you might see overgrown plants and pots. Please avoid buying these as the plant is very simple and quick to grow and should not be started very early. Schedule it early in spring to make it last until winter. 3. Avoid excess moisture in the early few days of rooting. The cut stem is weak and thin and extra plugging will damage it. 4. Warm temperatures roughly around 70-degree F is favorable for the propagation of calibrachoa, especially for the first few weeks. 5. Pinching the liners after rooting helps further root development. The cuttings must be moist and soft when you pinch. Hardened cuttings will not branch properly. What makes Superbells® Lemon Slice so unique is its bicolor pattern of white and bright yellow never seen in a Calibrachoa. Calibrachoa plants are very easy plants to grow and maintain. They need a well-drained soil which has a balanced (neutral) pH, lots of sunny and water-soluble fertilizer. Million bells attract butterflies and hummingbirds making them a good addition to your garden. They also serve as great hang basket plants, thanks to their trailing habits, low maintenance requirement, and lovely blooms. These Calibrachoa or million bells are ready to put on a show at your house! What Is A Composite Flower?